To all the mothers out there in the world, Happy Mother’s Day. We celebrated here in the best way possible. I got to go plant shopping and then Kat and I planted flowers in the deck planters, my herb planter for the deck, bunches of mint in my yard, and my favorite mother’s day present–from Zak–three baby curry leaf plants. 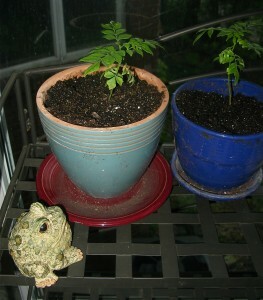 We potted them in pretty pots and put them in the sun porch to stay until the nights warm up. I am emboldened by my failure to kill my rosemary plants and my kaffir lime tree over the winter, so I decided to go all out and get the curry leaves. I even ordered lemongrass seeds. Zak’s parents, Tessa and Karl gave me a gift certificate which I used to buy seed-starting equipment, gardening books, and a compost bin. It was a very merry, foodielishious, gardener’s Mother’s Day. Lemongrass from an Asian grocery will root itself in a glass of water, and then you can plant it. I’m totally serious. It’s dead easy. I am so envious that you have a Kaffir lime tree and you’ve reminded me now to try and find Curry leaf plants! I so enjoy reading your blog and creative recipes. The Samoosa inspired potato recipe is going to be a fav-I’m certain! Barbara are your 3 curry leaf plants all the same or were you able to find one of each type? They are all the same. They also carry curry plant, but I really wanted the curry leaf plants. Eventually, I hope to be able to supply all of my own curry leaf needs, even as I cook more South Indian dishes.